From Philadelphia Area: Take Ben Franklin Bridge to Route 30 (Admiral Wilson Blvd.) and follow signs to Route 70 East. Follow Route 70 to first Cuthbert Blvd. ramp on right (Cuthbert Blvd. South) saying Collingswood. Follow Cuthbert Blvd. to Haddon Ave. to the festival. From New York and North: Take the New Jersey Turnpike south to Exit 4. Stay right off the Exit (Route 73) to the entrance for interstate Route 295 on the right. Take the second entrance (South) and follow 295 to the next exit, Route 70 West. Follow Route 70 to the second Cuthbert Blvd. ramp (after an underpass) Cuthbert Blvd. South/ Collingswood and follow Cuthbert to Haddon Ave. to the festival. From the South: Take the New Jersey Turnpike north to Exit 4. Stay right off the Exit (Route 73) and you will see the entrance for interstate Route 295 on the right. Take the second entrance (South) and follow 295 to the next exit, Route 70 West. Follow Route 70 to the second Cuthbert Blvd. ramp (after an underpass) Cuthbert Blvd. South/Collingswood and follow Cuthbert to Haddon Ave. to the festival. Take the Train! : The PATCO Train ride is 15 minutes from Center City Philadelphia. 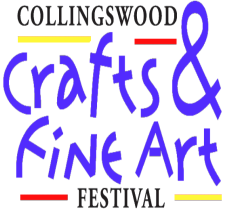 The Festival is half a block from the Collingswood Station. Parking is free at all NJ PATCO Stations. Parking is available at the PATCO Speedline lot on Atlantic Ave. Continue on Cuthbert past Haddon to Atlantic Ave. turn right and continue to PATCO parking lot. There is also free parking throughout the neighborhoods.